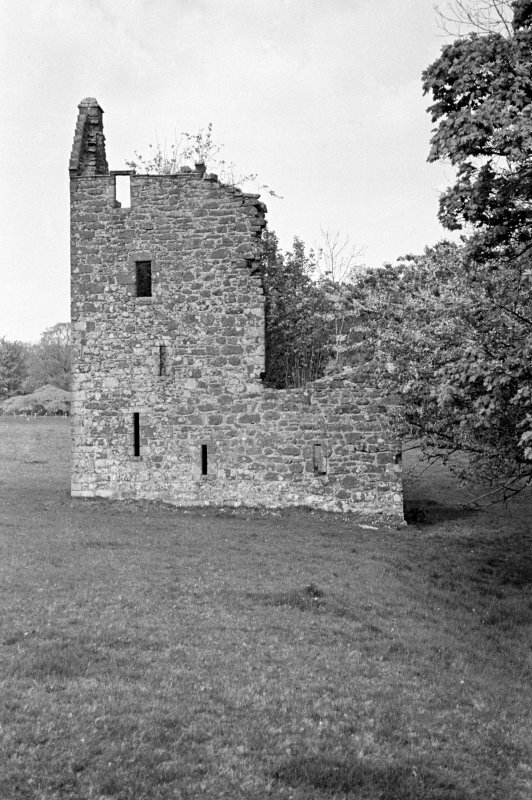 Kingencleugh Castle. View from NW. 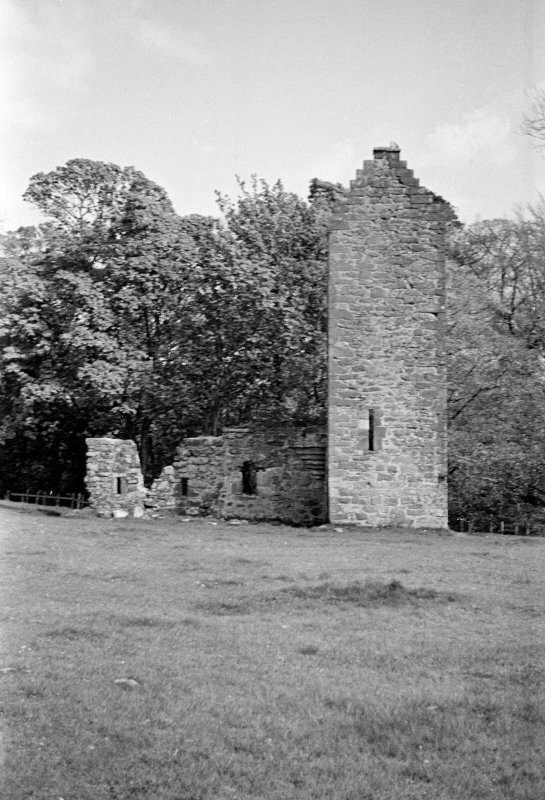 Kingencleugh Castle. View from SW.
Kingencleugh Castle. View from N.
Kingencleugh Castle; From the extant remains, this seems to have been built more as a dwelling than for defence. John Knox is said to have visited it in 1556. Hew Campbell of Kingancleuch (sic) is mentioned by Knox in 1544. Thereafter numerous references to the Campbells of Kingancleuch occur until the late 18th century. The remains are those of a four storey L-shaped residence of ashlar-ended rubble masonry. 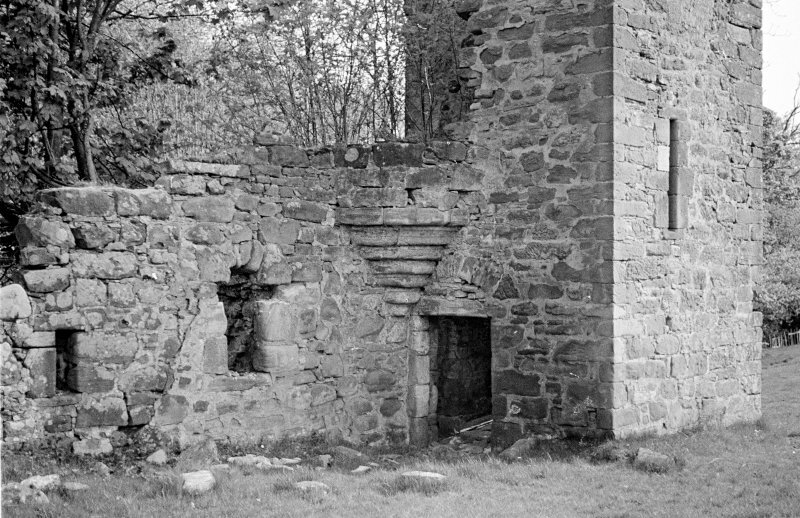 The remaining walls are 0.8m thick; the two lower floors have slit windows only. The NW wall, forming the end of the W arm of the 'L', stands to its full height of some 7.0m, and is surmounted by a crow-stepped gable. The lower part of a corbelled turret remains in the re-entrant angle, in the W arm of which is the entrance. The main ground floor apartment appears to have been barrel-vaulted. The house is in a fair defensive position,overlooking ground sloping to the S. It is almost exactly parallelled by Jerviston House (NS75NE 1 - a 16th century laird's house). Kingencleugh Castle: name verified. As previously described.